How I went years without knowing how to make little chocolate bites, bon bons and more is beyond me! When my daughter came home from school and told me that one of the kids at school had demonstrated how to make little chocolate bites in class, I insisted she had to show me how! And it was as simple as crushed up Oreos and cream cheese for the filling. Yum. So I have to say… this kind of treat was right up my alley. I decided to make these yummy Chocolate-Covered Chocolate Chip Cheesecake Bites. As if that wasn’t a mouthful, try making these cute treats without stuffing a few in your mouth while you’re preparing them. Once the cheesecake bites were all set and the chocolate firmed up, I couldn’t keep the kids from running back for another one. And since then, we’ve been whipping up other fun chocolate treats. Like these: Dark Chocolate Almond Truffles, Dark Chocolate Almond Truffles, and No Bake Cookies. I’m a huge chocolate lover. If you haven’t noticed. I like sweets and I absolutely LOVE creating fun recipes for my family. It’s like being an artist… but, you get to eat all of the fruits of your labor. Absolutely. THE. Best. Job. In the world! Being a food blogger is so much fun, and it’s pretty nice to be able to have such a flexible schedule as well. Soften cream cheese. Mix together with mini chocolate chips and sweetened condensed milk. Form tablespoon size balls and place on parchment paper. Freeze for at least 30 minutes. 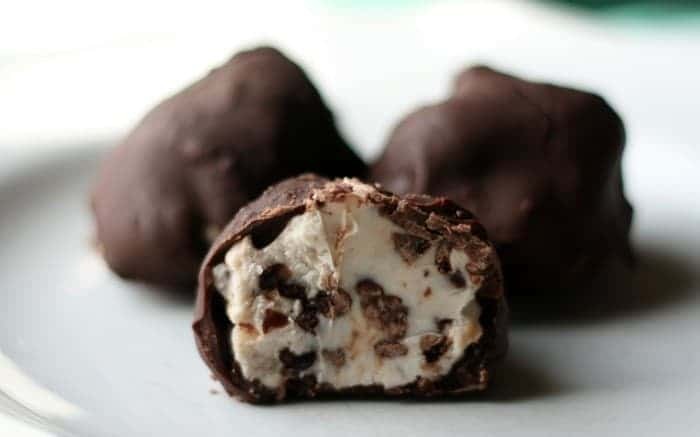 Melt chocolate chips and dip cheesecake balls into melted chocolate. Place back on parchment paper to harden. My daughter would love this recipe! Pinning this one! These look so yummy. Love chocolate chips and chocolate so right for me. Pinning and making. Yum! What a great post! This is one of my faves this week on Wake Up Wednesday! Thanks for sharing. Oh yum! What delicious treats! Sharing. Thank you for bringing this deliciously easy recipe to the Hearth and Soul Hop, Jessica!